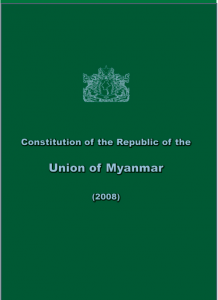 The Constitution of Myanmar – Myanmar has had three Constitutions since the country gained independence from the United Kingdom on January 4, 1948: the first, a federal democratic Constitution proclaimed in 1948; the second in 1974, a socialist Constitution under one party system and the third and current Constitution of the Republic of the Union of Myanmar (Consitution) whch was was published in September 2008. The Constitution, drafted by the military, in a process that was neither inclusive, open or participatory process, was approved in a referenum. Under the Consitution the military (the Tatmadaw, or “Defense Forces”) is recognised to be a separate and autonomous legal entity exisitng outside the civilian “sovereign” state which is described as consisting of the legislative, executive, and judicial branches. The Consituiton decrees that 25% of parliamentary seats be held by appointees of the military. The President, designated as “Head of State,” has no sovereign power over the military or military-controlled territories. The military’s Commander-in-Chief is exempt from all legal constraints (including prosecution for genocide and war crimes) and is unanswerable to any representative of the legislative or judiciary and has the sole right to administer and adjudicate all affairs of the Defense Forces. No qualifications for appointing the Commander-in-Chief are set out in the Constitution, no parliamentary approval of his appointment is required and no means are set forth for his removal. The President must obtain the approval of the Commander-in-Chief to perform certain acts yet the Commander-in-Chief cannot be removed by the President and has the right to “take over and exercise State sovereign power” in states of emergency. In February 2013, President Thein Sein announced that a committee would be established in the national parliament to consider amendments to the Constitution. In October 2013 this new body the Myanmar’s Constitution Review Joint Committee invited proposals from the public in relation to amendmnets to the Constitution. The ruling Union Solidarity and Development Party has rejected calls to revise the Constitution. According to the Constitution, Courts are divided into three systems: civilian court system, the Constitutional Tribunal, and the Courts-Martial. The civilian court system in Myanmar is hierarchical. In order of importance are the following courts: the Supreme Court, High Courts of the Region, High Courts of the State, Courts of the Self-Administered Division, Courts of the Self-Administered Zone, District Courts, Township Courts, and other courts established by law. The Constitutional Tribunal acts as the final authority on matters of constitutional interpretation. It is the highest court of the country to adjudicate constitutional issues. The Courts-Martial are a separate set of courts and adjudicate all crimes committed by the military so that members of the military never have to appear before civilian courts regardless of their crime. Pursuant to the Constitution of Myanmar court-martials fall outside the jurisdiction of the Supreme Court.